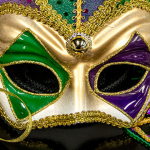 There’s more to hosting a Halloween party than simply inviting over costumed guests – your house has a role to play, too. 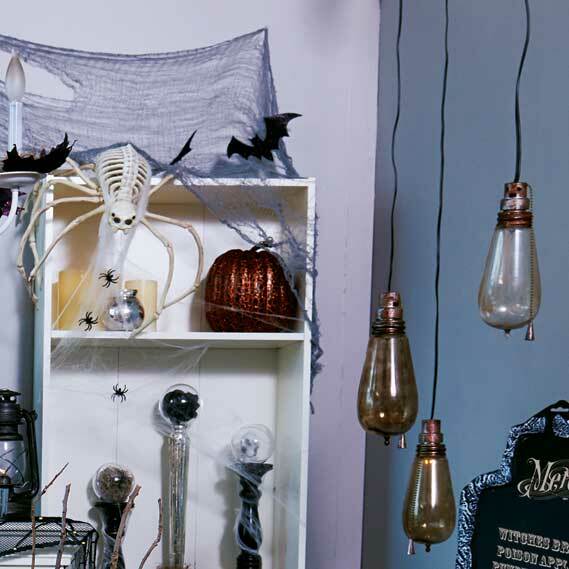 This decorating theme is all about the Eerie Elegance of Halloween, and combines antique chic with a creepy-cool atmosphere. Of course, even if you have the best-looking Halloween decorations in the world, everything will still look a little out of place if you’re serving snacks on ordinary orange and black paper plates. 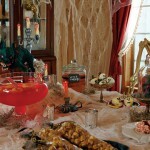 There are lots of easy ways make your Halloween party supplies look as amazing as the rest of your party décor. Here are few quick tips for tackling both. Halloween mood lighting is key. Dim your lights and hang a few of these old-looking attic bulbs from your ceiling. Their rustic style looks like something out of a black-and-white horror film, and they continually flicker throughout the night to cast spooky, jumping shadows on every surface in the room. Use layered backdrops to add depth to your décor. They might seem a little cheesy to some, but spider webs are a classic Halloween decoration, and they can look amazing when done right. The key is to stretch them as thin as possible so that they look realistic. Also, combining them with other materials can improve the look in a big way. We used some pieces of chicken wire behind our webs, and this lacy black mantle scarf in front. It’s like a big, mesh spider web, and there are even some orange LED lights woven inside it. They don’t have to be real, either. This prop phone looks just like an old rotary-style phone. 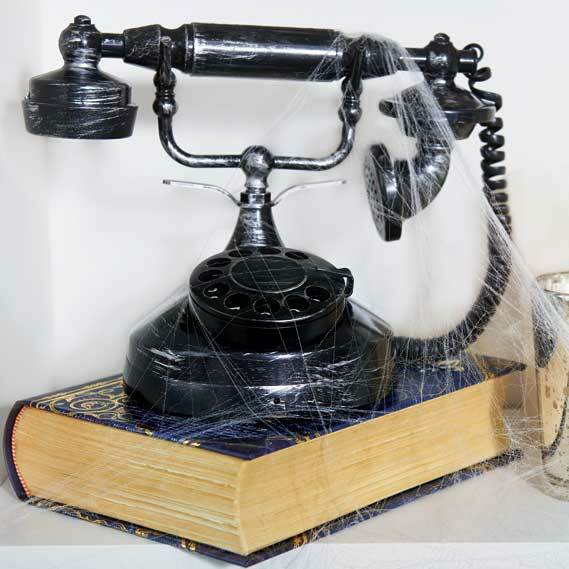 Unfortunately, it won’t receive any calls from beyond the grave, but one fun idea is to rig up an old phone ringing sound effect on some hidden speakers to startle unsuspecting guests. Display it on a stack of hardcover books with fake spider webs to add some old-school cool to your party. Chandeliers are hard to fake, but if you happen to have one in your party space, go all out! 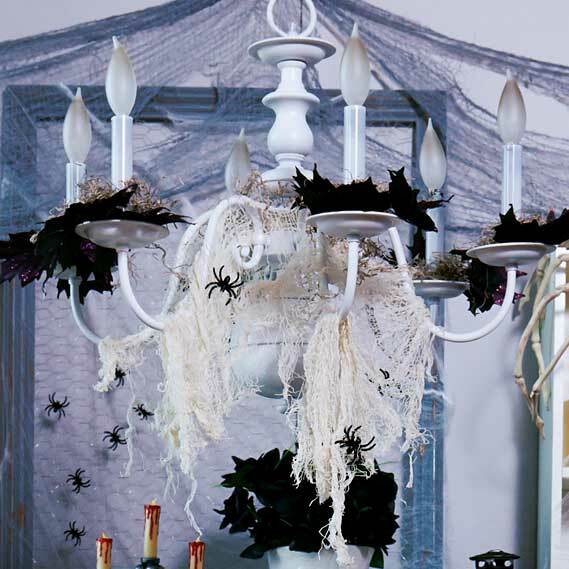 There’s something about these hanging lights that is inherently creepy, and you can easily enhance them by draping gauzy fabric, black roses, and faux straw over them. Electric candle-style bulbs maximize the effect. 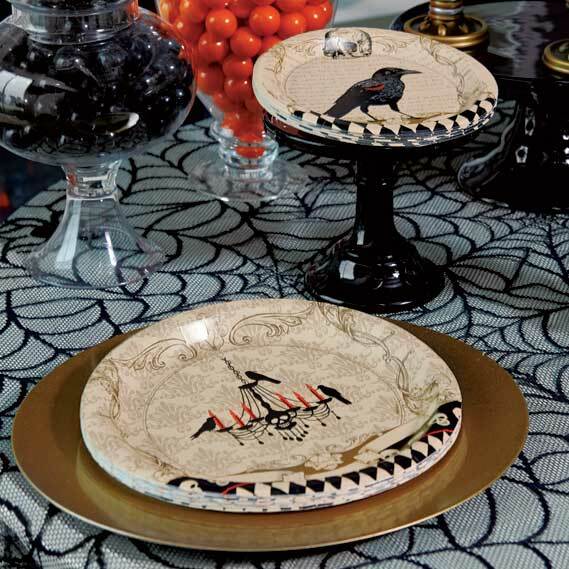 Even simple paper plates can bring big atmosphere to a Halloween party. These paper plates are from one of our favorite newer themes, the Skull Mansion. Not only are they made from sturdy, quality stock, but they look fantastic: subtle tones of aged sepia in the background make up the majority of the design, which is capped off by bold, Victorian-inspired illustrations of ravens and skulls. To add to the look, we’ve combined them with metallic gold and glossy black plastic chargers underneath. 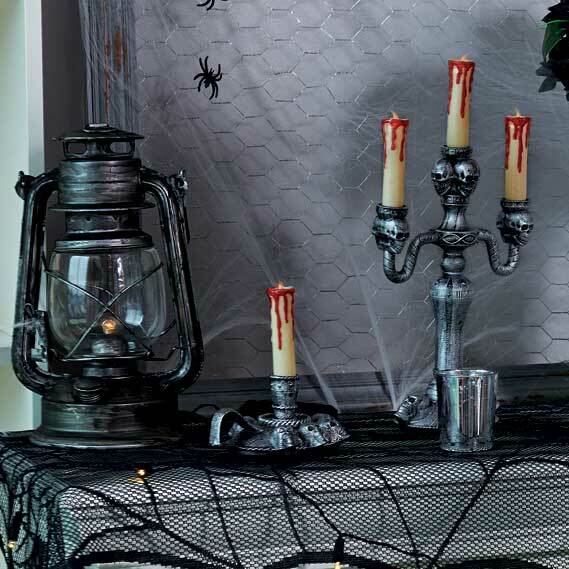 It’s simple, but really contributes to the “spooky chic.” We also swapped a plastic table cover for a mesh black spider web table runner. Break out the bar cart. 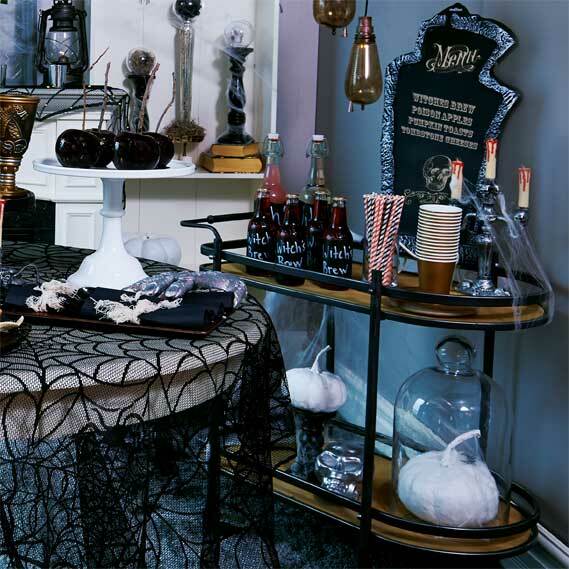 To make things easier, you can also just disguise an ordinary cart or a small table with a sheet or a spider web, like we did with the table above. Either way, having a dedicated area for drinks. alcoholic or not, is always a good idea. Use a chalkboard sign to list out the menu; black paper and chalk can be used to label individual bottles, too. 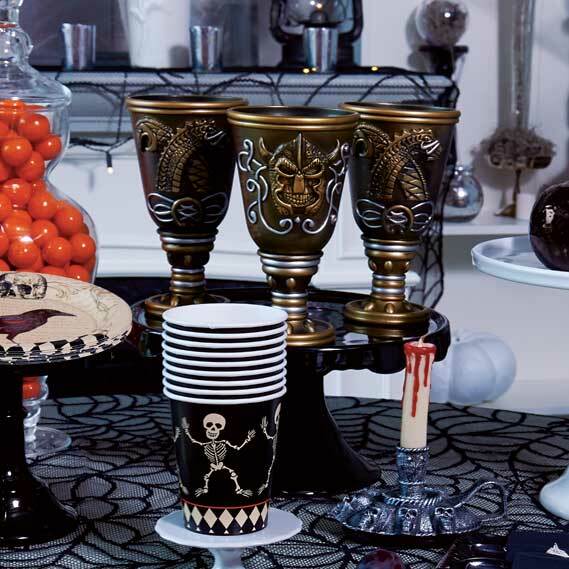 Speaking of drinks, these paper cups, printed with skeletons and a harlequin pattern, are another great choice for this Halloween party theme. For an even cooler look, set up some goblets on the table. They’re just props, but these plastic cups definitely lend themselves to the aesthetic of a royal banquet hall. 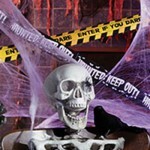 That takes care of the inside of our Halloween scene, but there’s more to come. 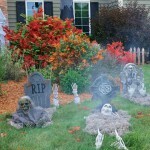 In our next Halloween decorating post, we’re going to take these ideas outside to show you how to decorate your yard and porch. 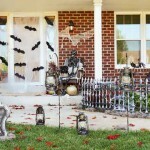 You can also learn more about our top 10 Halloween decorating ideas here.